Peach-flavor iced tea, chopped peaches and a bit of ground ginger add phenomenal flavor to these good-for-you JELL-O snacks. Add boiling water to gelatin mix; stir 2 min. until completely dissolved. Stir in tea and ginger. Place peaches in 6 muffin cups sprayed lightly with cooking spray; cover with gelatin mixture. Refrigerate 2 hours or until firm. Unmold onto dessert plates just before serving. 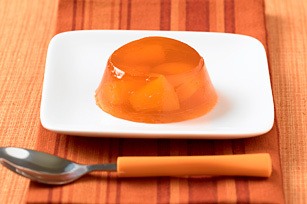 To make gelatin that is clear and uniformly set, make sure the gelatin is completely dissolved in the boiling water before adding the cold liquid. To remove gelatin molds from muffin cups, dip knife in warm water, then run knife around edge of each gelatin cup to loosen. Use moistened fingers to gently pull gelatin cups from muffin pan.